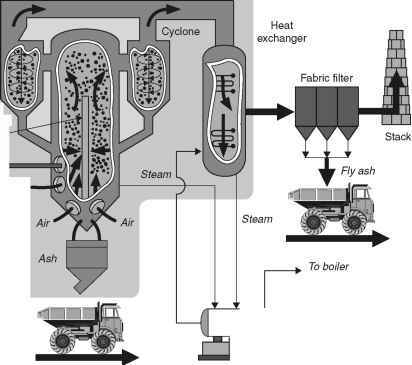 Fine solid particles called fly ash escape with the flue gas from a furnace. This fly ash will often contain high levels of toxic metals and must be captured. Capture is achieved either by using a fabric filter called a bag filter, or by employing a device called an electrostatic precipitator. Both should be capable of removing close to 100% of the dust from the flue gas. Once captured this dust must be safely buried in a landfill. The same applies to the chemical residues which result from the various flue gas treatment systems used to remove harmful material from the exhaust gases of the plant. Depending on the treatment process, the residue may be a solid or a wet slurry. In the latter case, the slurry will normally be dried using the hot exhaust gases before disposal.